anymore. I used to be aloof. I used to be the picture of health. I used to be alone. This week’s Patients for a Moment question is easy to answer and profound at the same time: Who would you be without your illness? That question is kind of simple but stunning in its implications. Unlike a lot of the bloggers who responded, I remember a time when I wasn’t sick; I remember being able to wear heels all week or stay up all night reading or go a few days (or weeks) getting little sleep, without any consequences. I remember when my life wasn’t filled with doctors visits, lingering pain and sleepless nights. I remember a time when I didn’t have to think about questions like this. But, I am thankful, too, for what I have been able to accomplish, despite my illness. Even though some days I’m so drained I can barely make it through, even though I’m still recovering from a Thanksgiving to Christmas where I worked every day—with literally no days off—I’m proud that I work in the field I do, with people out in the world who don’t know what I’m going through and who think what I produce is great, regardless. I’m good at what I do despite my illness. That’s a victory, no matter how small it may seem on days where I can’t even type because my fingers are so swollen, when sitting hurts as much as standing, when my brain is so foggy I can barely string three words together, much less write an article worth reading. Who would I be without my illness? I’m not really sure that question is even productive, much less truly answerable. I am who I am because of my illness, at least in part. I couldn’t really say who I would be without it. I think it’s a really awesome idea to think about the last week and be grateful for something that happened in it. There was a lot of work to be done, crammed into a four-day work week. But I think the best part came Thursday night. The Professor dug out my old GameCube. When we were in university, we would pay the Cube all. the. time. And doing that again this week brought a lot of that back—the nervous, flirtatious part before we officially started dating; the giddy early parts of our relationship; the falling in love parts; all of it came rushing back as we beat the crap out of the other team in Mario Kart: Double Dash and Super Smash Bros. Spending that time with him—and all the time I spend with him—that was easily the best part of my week. #HAWMC day eight: why do you ask? Aren’t you feeling better yet? Why don’t you try this wonder drug? Or this shiny, fabulous snake oil? Don’t you feel better yet? How can you be fine one day and bed-ridden the next? How can each day be so completely different? How can each day be so completely the same? Are you sure you’re not faking? Are you sure you’re not exaggerating? How am I supposed to help you when you don’t ever stay better? I did something I was afraid I would no longer be able to do today. The last time I went, it caused so much pain that it’s been two-and-a-half years since I tried it. As a child, my parents would have to pull me off the rink to get me to stop. I could skate forwards and backwards, execute skate-over-skate turns and loved being the end of the whip. 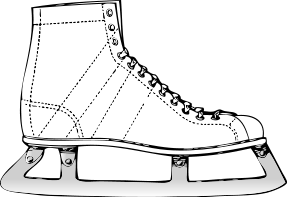 I loved the schink-schink of freshly sharpened skates on smooth ice, having to skate fast enough to keep warm on outdoor rinks and getting hot cocoa afterward. I loved going to Play It Again Sports each year to pick out new skates. I loved everything about ice skating. Last time I went (before today), I was hoping to recapture those same feelings, to feel like a kid again, if only for a few moments. It was excruciatingly painful, and after just a few minutes, I was done with skating, though I fought through it as best I could for awhile, trying to allow those who were with me to enjoy themselves. Today, skating still hurt, but instead of being frustrated that I couldn’t skate for hours on end as I could when I was six or eight, I tried accepting my limitations, resting when my feet hurt and skating when they didn’t. And while I’m nowhere near as graceful or steady on skates as I once was, I can still glide across the ice. I can still enjoy skating. So, that’s one thing I got to take back from this psoriatic arthritis. And it felt pretty awesome.